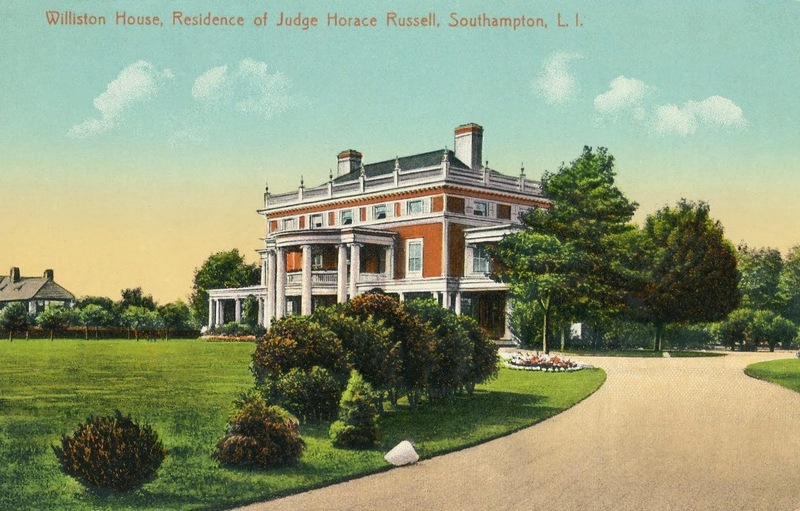 'Williston House', the Judge Horace Russell estate designed by Bruce Price c. 1898 in Southampton with landscaping by Anette Hoyt Flanders. Russell was a judge on the Superior Court of New York from 1880-1883 and was general counsel for A.T. Stewart's estate. Click HERE to see 'Williston House' on bing. Beautiful property. The balustrade around the roof has been removed & second floor balconies enclosed (bathrooms & closets? ); still, not much change for a 115 year old house. The shutters added to the second floor windows make it look kind of colonial (to me). But my question is: what is the architectural style in the picture? I just shot you over an email with some cool history that you may want to add to the site. Enjoy! I see that it is all-white now, but the rusty color with white trim is more interesting. Is it brick?